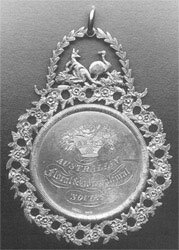 A silver medallion made for the Australian Floral and Horticultural Society by J J Cohen, jeweller, watch maker and optician. John Joel Cohen, also known as Joel John, was born in Manchester, son of Simeon Cohen (d.1852). His brothers were Baron Burnett Cohen and Jacob Charles Cohen. His first marriage was in England to Rebecca Cohen, who died at Manchester in 1832, aged 32. His second marriage was to Frances Sarah Neadon in England; she was a gentile. They had a son Francis and a daughter Charlotte, both born in England. John Joel Cohen died on 11 June 1853, aged 55, and was buried by the Reverend Jacob Isaacs in the Jewish section of the Devonshire Street Cemetery; his remains were later relocated to Botany Cemetery. Cohen was survived by his second wife and his three sons and four daughters of his two marriages. His second wife was buried in the Presbyterian section of Botany Cemetery on 4 August 1856. His eldest daughter Charlotte married Henry Barnett with Jewish rites in Sydney in July 1841. John Joel Cohen worked as a jeweller in Wilmott Street, Manchester, before setting up in business at Young Street, Sydney. His wife died during his absence and he returned to England. He was declared bankrupt in 1839. He came back to Sydneyfrom Liverpoolon the Jessie on 19 February 1839 with his second wife and two children. In July 1839, Cohen opened his ‘Temple of Fashion’ at 479 George Street, assisted by his son. He was in direct and acrimonious competition with his wife’s brother Mosely Moss Cohen, a jeweller, and also became involved in a series of minor court cases. In June 1843, after a public disagreement over rent with his landlord Martin Gill, Cohen moved his extensive collection to other George Street premises. He produced fine presentation colonial silver and in November 1844, had on display an engraved silver salver made for presentation to the Chief Justice Sir James Dowling. From 1845, the firm was known as JJ Cohen and Sons. After the discovery of gold in NSW, they became exporters of gold. Although not a seat holder of the York Street Synagogue, Cohen was a prominent supporter of Jewish equality. In September 1844, he was a member of a Jewish Deputation to the Legislative Council recommending denominational education. In 1859, the status of his part-Jewish daughter Julia led to the secession of the Macquarie Street congregation from the York Street Synagogue. Joel John Cohentook an active interest in civic affairs and was on the Citizens List of eligible voters in 1842. In the first City election in November 1842, he supported Robert Owen and later Ambrose Foss and William Roberts. In October 1843, the Sydney District Council had offices on his premises and on 23 August 1844 he and his son Francis attended the Lord Mayor’s Ball. In August 1844, he supported a Citizens’ Petition and delivered an eloquent public speech condemning the misuse of parliamentary privilege in the Legislative Council. Joel John Cohen was Councillor of the Sydney Municipal Council from 1 November 1852 to 1 February 1853. He resigned due to illness and died in June 1853. Bersten, Helen 1995, Jewish Sydney: the first hundred years 1788-1888, AJHS.